Abiotic stress is currently being realized as one of the most ubiquitous and potential threats to human existence which results in the overwhelming consequences to human health as well as agricultural systems. Different types of abiotic stresses viz., salt stress, heavy metal stress, water stress, temperature stress, and chilling stress are the major constraints to sustainable agriculture causing numerous direct and indirect effects on plants thereby affecting the quality and productivity of different plants in one way or the other. However, plants possess a range of potential cellular mechanisms that help them in overcoming the devastating stressful effects. Plant elicitors, certain endogenous and exogenous organic and inorganic compounds, play a vital role in helping the plant to mitigate the stress-induced changes by modulating an array of processes at cellular and molecular levels. Among the different elicitors employed during stressful conditions, abscisic acid (ABA), salicylic acid (SA), methyl jasmonate (MeJA), hydrogen peroxide (H2O2), and nitric oxide (NO) have proven promising. This chapter will summarize the role of these elicitors during stressful environments. In addition, some of the signaling aspects through which the cell metabolism is modulated by these elicitors have also been discussed. Lastly, a brief cross talk mechanism of some of these exogenous elicitors during these environmental perturbations has also been covered. 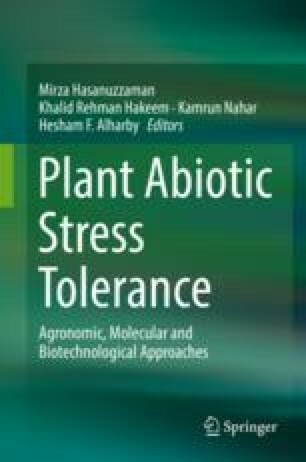 The collected literature indicates that the manipulation of these selected elicitors might also be an effective way to confer abiotic stress tolerance in different crop plants. Bilal Ahmad and Abbu Zaid contributed equally to this work.